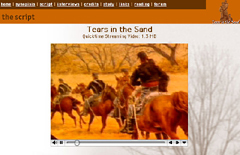 Tears in the Sand, a television program and companion website, is one of the most comprehensive documentaries available on the Sand Creek Massacre. The documentary website explores the sequence of events, in 1864, when John Chivington led the Third Colorado Regiment (approximately 700 men) in an attack on Black Kettle and his band. Two hundred Cheyenne, including women and children, were slaughtered in a brutal massacre that shocked the nation. 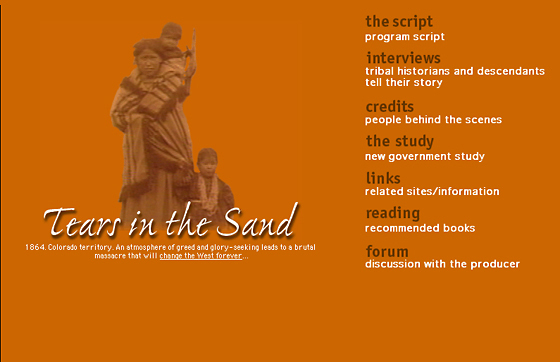 How and why could the Sand Creek Massacre have happened? 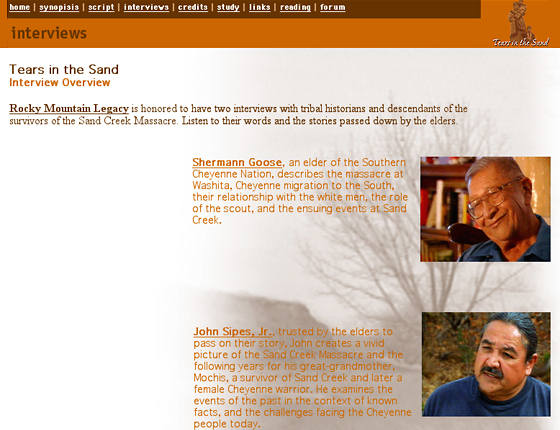 Cheyenne tribal historians and descendants of the few survivors share their stories on the Tears in the Sand website. Highly controversial, Sand Creek is still contested in courtrooms today. In 1998, a government bill passed that reopens the study of the Sand Creek Massacre and its location. The study involves representatives of the Colorado Historical Society, the National Park Service, the Northern Cheyenne Tribe, the Southern Cheyenne Tribe, the Northern Arapaho Tribe and the Southern Arapaho Tribe. 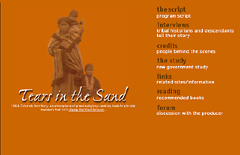 Tears in the Sand website includes interview transcripts, streaming video, the Tears in the Sand documentary program script, information about the Sand Creek Massacre study and recommended reading. The website interface is simple and straightforward, the color scheme is built from the rich hues used in Native American artwork, and the content is moving. and the Colorado Historical Society.